When the werewolf protagonist of the Old French lay of Melion recruits a band of other wolves in order to lay waste to Ireland, this activity—unique to Melion—is informed by the medieval Irish view of díberg ‹(wolf-like) brigandage’. These aspects of Melion’s setting and plot are major developments in the medieval werewolf tale most famously attested in Marie de France’s Bisclavret. 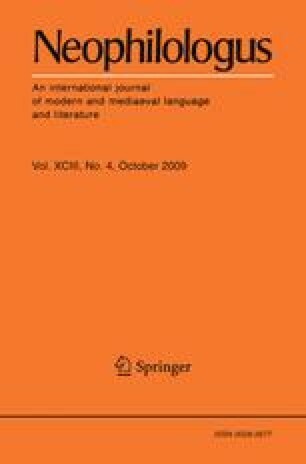 The case of Melion has profound implications for understanding Celtic influence on Francophone literature in the twelfth and thirteenth centuries. I am grateful to Prof. Tomás Ó Cathasaigh (Harvard University), Prof. Catherine McKenna (Harvard University), Prof. Keith Busby (University of Wisconsin-Madison), Aled Llion Jones (Harvard University), Margaret Harrison (Harvard University), and the reviewers for Neophilologus, who made valuable comments on drafts of this article. Stokes, W. (Ed.). (1900). Acallamh na Senórach. In W. Stokes & E. Windisch (Eds. ), Irische Texte 4.1 (Leipzig: S. Hirzel), xiv + 1-438. Accessed via the Corpus of Electronic Texts (CELT) at University College Cork. URL: http://www.ucc.ie/celt/published/G303000/index.html.